We expect a lot from our junior celebrity chefs—all those young guns chasing the spotlight on reality TV. Intense scrutiny awaits these aspiring showmen and women as they parlay their budding stardom into restaurants of their own. But while many who looked so good on the small screen have failed to live up to their promise (we’re looking at you, Sam Talbot), a few are now proving their true worth in the real world. 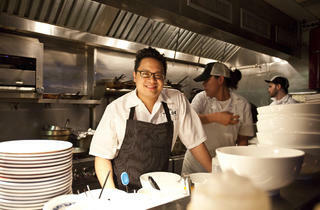 Dale Talde, who came close to the title on two seasons of Top Chef, has taken his sweet time in unveiling his solo debut. 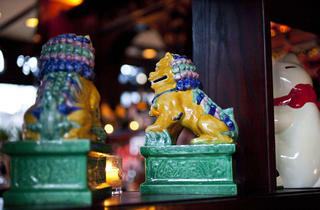 Last year, the former Buddakan chef hyped his restaurant-in-the-works with a sold-out, one-night-only pop-up downtown. 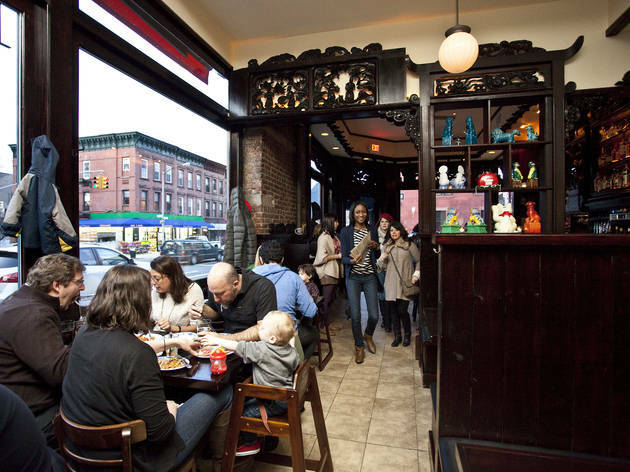 But the eponymous place he launched recently, on the southern reaches of Park Slope’s main drag, is so understated, it’s as if he’s hoping his fans don’t notice it’s there. On a recent Friday night, he was clearly out of luck. If the mosh pit at the bar didn’t scare away walk-ins (the place takes reservations only for big groups), then the host quoting a two-hour wait for a table certainly did. 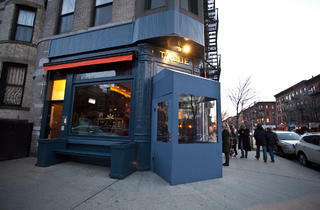 The cramped corner restaurant doesn’t look much like a hot new food destination. 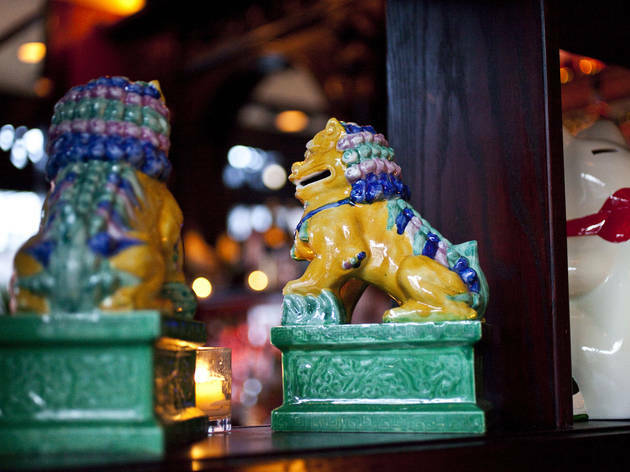 With its dark-wood booths and mahogany carvings depicting dragons, foo dogs and samurai swords, the place feels like an old-school bar and grill crossed with a 1970s Chinese restaurant. The seating is uncomfortable; the decor kitschy in the worst way; the tiki-style cocktails all sickly sweet. 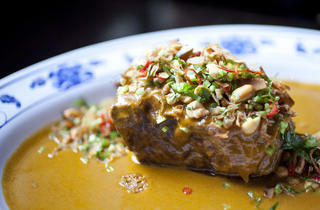 But the food turns out to be well worth a wait and a bit of dining-room discomfort. 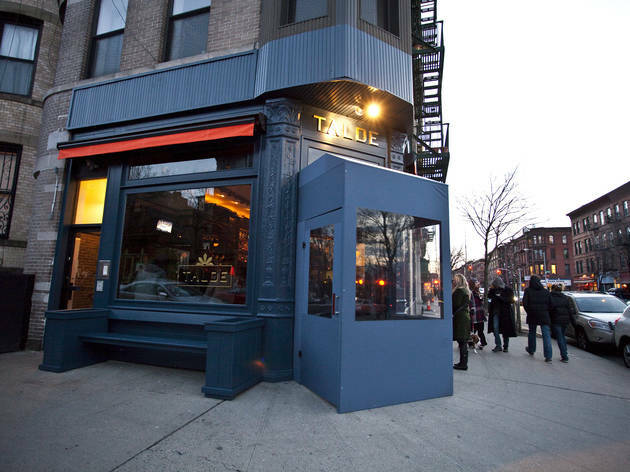 Talde is cooking some of the most exciting food to hit this staid Brooklyn neighborhood in ages—innovative, well priced, fun and delicious. 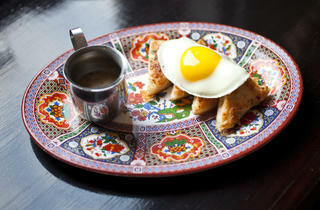 The playful, genre-busting menu is much more successful than the space as an Asian-American mash-up. 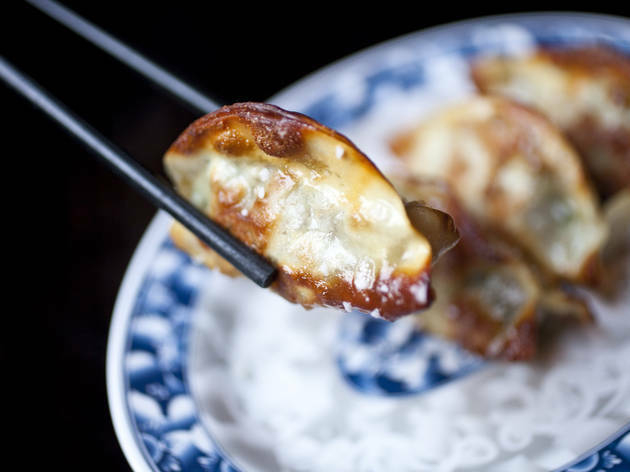 Talde’s “pretzel” dumplings are classic pork-and-Chinese-chive pot stickers, burnished the same shade as the street-cart snack with egg wash and butter, then dredged in coarse salt—a crunchy and rich cultural composite that makes sense. 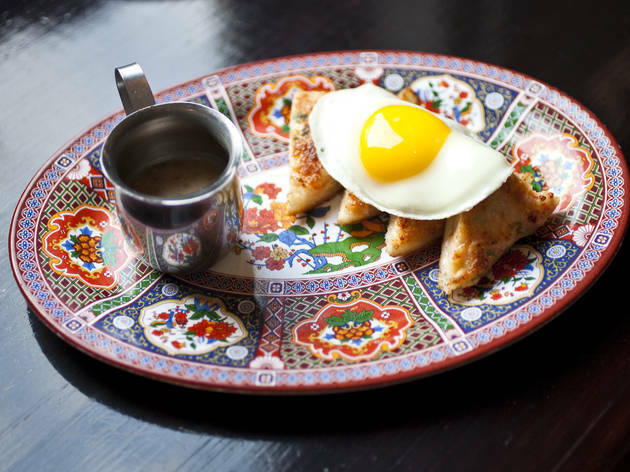 And the chef pays homage to the 24-hour-diner breakfast with an appetizer of shrimp toast topped with Chinese sausage gravy and a fried runny egg—another smart, fusiony dish featuring plenty of sweet sausage nuggets and big hunks of shrimp. the usual hot, sweet, sticky glaze, it comes with a smooth and spicy buffalo-wing style sauce made with Frank’s RedHot and yogurt. 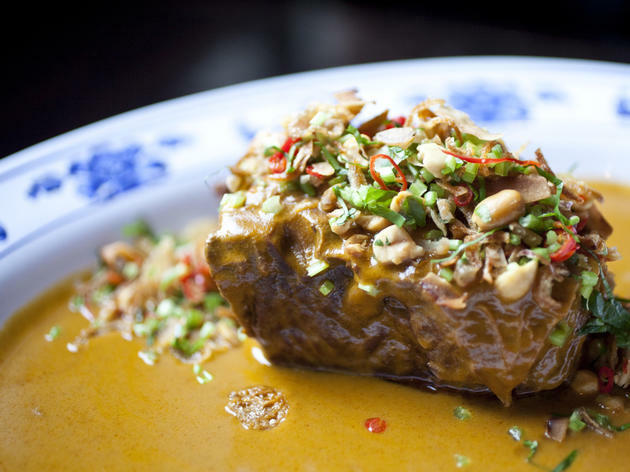 A peanutty kare kare is a more traditional nod to the chef’s Filipino heritage, but with boneless short ribs instead of the typical oxtail, braised in coconut milk and shrimp paste until tender enough to cut with a spoon. There’s just one dessert, a Filipino halo-halo topped with fresh seasonal fruit. Like just about everything here, there’s a bit of lowbrow Americana thrown in—a final sprinkle of Cap’n Crunch cereal on the psychedelic mélange of crushed ice, coconut milk, tapioca pearls, pineapple, mango and brûléed bananas. Talde, visible from his small open kitchen, is clearly enjoying himself here as the star, at last, of his very own show. 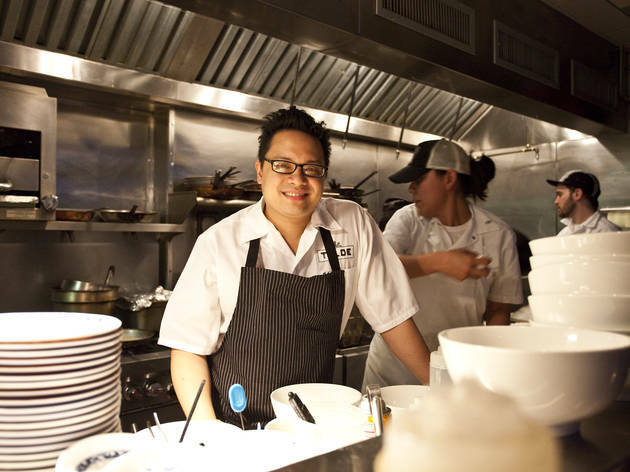 Despite its cosmetic flaws, his restaurant succeeds for one very good reason: Instead of working the dining room like a TV star, this Top Chef is back by the stove, making sure the food’s good enough for all its neighborhood judges. Drink this: Even the simplest cocktails here tend to be off-balance. Opt for beer instead, like a tall pint of Brooklyn Brewery’s sweet and funky Sorachi Ace ($6) or a nutty Red Rice Ale from Hitachino ($10). Sit here: The high-backed wood booths are the most spacious and comfortable seats in the house, but the small bistro tables near the windows offer much better views of the chef in his kitchen. Conversation piece: The restaurant’s Asian-themed wood carvings once filled the “Oriental Study” in the upstate New York mansion belonging to Arnold Constable, who used to own one of the most successful department store chains in the country. 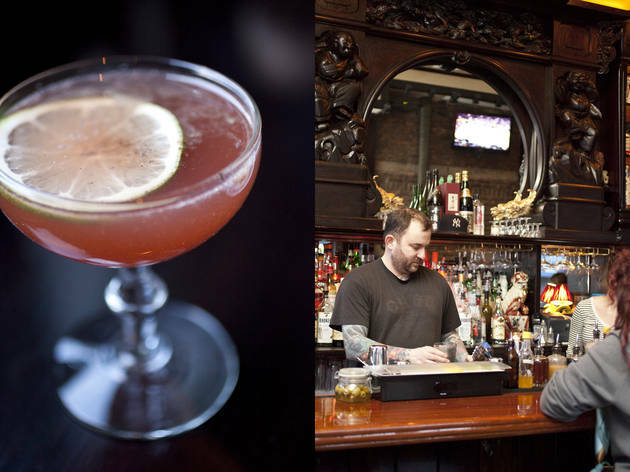 Talde’s partners, restaurateur David Massoni (Thistle Hill Tavern) and bartender John Bush, found the carvings while hunting for antiques in Pennsylvania. 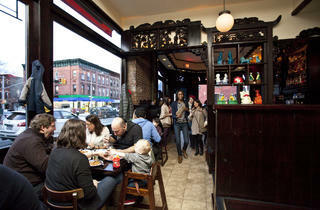 An awesome spot in South Slope that is perpetually packed no matter when you go. But for good reason. 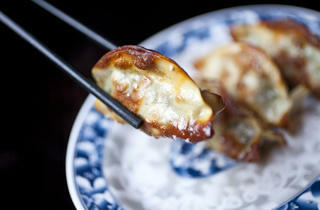 You must order the pretzel pork dumplings, Korean Fried Chicken and crispy oyster & bacon pad thai. The branzino is also a good choice if you're looking for something lighter. Skip the cocktails. Each time I go, I think I'll like them and I wind up disappointed. If you're ever visiting Green-Wood, this is a great place to go before or after. Talde brought Filipina food to a neighborhood full of pizza joints. That's the best reason to vote for it! 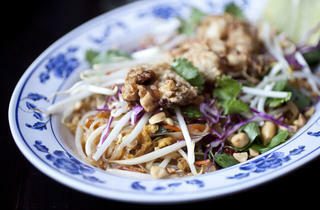 Big call but this would have to be in the running for some of the best dishes in Brooklyn. 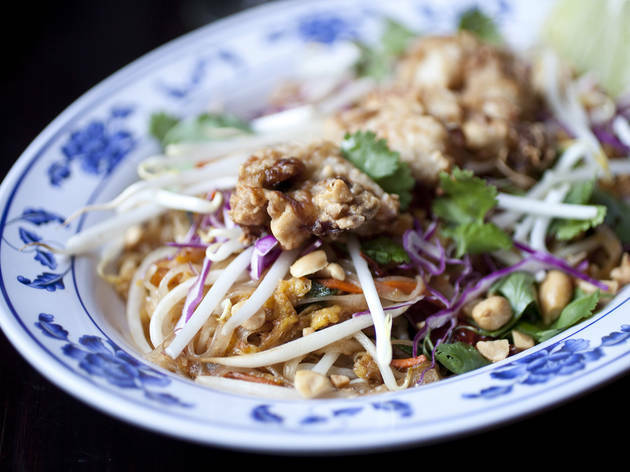 Kung Pao wings, crispy oyster and bacon pad thai, spicy kimchee… Incredible taste and creativity for what feels like a small neighborhood restaurant. 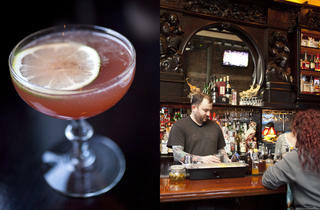 There’s a reason for the wait, so expect to put your name down and kick things off at the bar. This is not dinner, it's a food experience. Love the sliders, none of which are burgers. And the perilla leaves or is only bite-size but hits you with so many layers of flavor. Just wish it wasn't so crowded, but that's the price you pay for amazing.